Before all the Super Bowl ads start breaking into market, here's some work for the other "football". "Futbol Dreams is the latest from Toronto's Bensimon Byrne for Scotiabank. 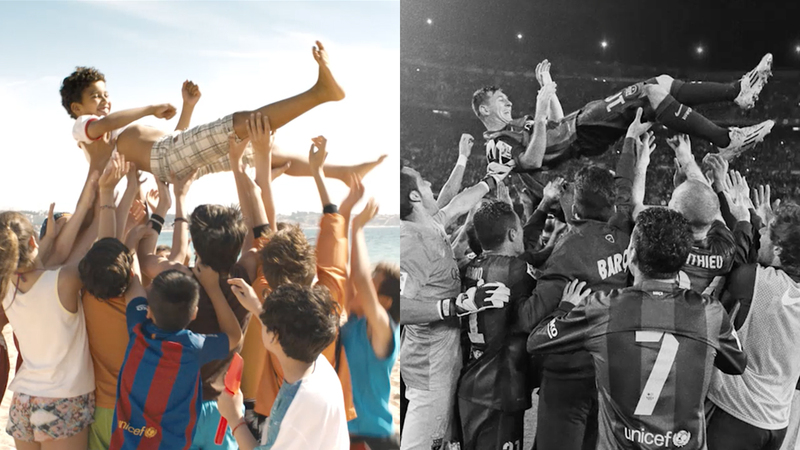 The spot recreates four goals, from four iconic players of FC Barcelona – Hugo Sotil, Gerard Pique, Andres Iniesta and Lionel Messi – except using kids.​ ​It's directed by Gary Freedman (Glue Society) via Toronto-based pro co OPC. The campaign celebrates Scotiabank’s sponsorship of the iconic FC Barcelona football team and their involvement in supporting thousands of youth football teams across Latin America. No matter where a child grows up in Latin America, they dream of being their football hero and scoring that magical goal that puts them in the history books. “Futbol Dreams” campaign brings this to life by perfectly recreating four goals from four iconic players of FC Barcelona. Football is a part of Latin American identity and has been for over a century. Scotiabank really wanted to give people in countries like Mexico, Chile, and Peru something that was stirring. After all, it’s football and FC Barcelona and that combination helps them feel incredibly connected to the game. Whether you play on a rural farm and have humble beginnings or a big city and play in a city square, the dream of being an iconic player and scoring an iconic goal, is something people across Latin America can relate to. Audio: Jared Kuemper, Berkley Inc.